Dr. James McDougall read those lines and others from his piece composed about the imagined lives of women and their clients at the Shakespeare Hotel. His work, a part of Sigma Tau Delta's annual Common Reader event, was inspired by Trethewey's Bellocq's Ophelia. His reading was followed by applause, and then a student took up Trethewey's book and started to read as if her inner poet was challenging McDougall to an old-style Arabic poetry competition. Our day continued in this vein, a mock competition between Trethewey and poets canonical and contemporary. 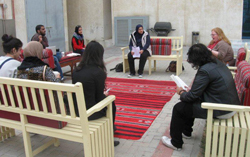 With the event, we strove to achieve a harmonious blend of American and Kuwaiti culture and met a challenge that the members of the American University of Kuwait's (AUK's) chapter of Sigma Tau Delta embrace each spring to unite our community in an uncommon event—reading and thinking about literary texts for fun. "The Common Reader event has always been a very cheerful event to hold for both the society and the AUK community," said Alia Mustafa Aref, the Chapter President in spring 2012. The poetry "competition" was her third day-long event for the honor society: "It was a time to get together and do what we all love to do, read. However, this year's success meant more to me since it is my first time organizing the event as president of the chapter. We were able to put together a very welcoming setting for the reading of Natasha Trethwey's book of poetry. This year the atmosphere was much lighter and warmer since we read poetry by Trethwey and various other poets. Some students and professors brought in their own poems to read, which only added to the pleasantness of the day. Many students participated, and many encouraged us to stay another day or to have a monthly poetry reading event. We had a lot of positive feedback from both faculty and the student body." "Lighter and warmer" may at first appear to be odd words to use in the context of a book about a woman's desperate turn to prostitution after failing to find respectable work. And yet, such an atmosphere did prevail as those who gathered in Kuwait learned a difficult history lesson about a remote time and place as they lounged in a familiar red, black, and white "gathering place," or diwaniya, constructed of benches along with pillows and rugs made from traditional Gulf Arab fabric known as Sadu. "I think it is our fusion of cultures that allow the students to move past their comfort zones and learn hard life facts from around the world," said Dr. Kathy Nixon, Faculty Sponsor of the chapter. "It also helps them to take pride in their own culture and traditions as well." Reading Lorine Carey's Black Ice in spring 2011 helped the students learn about segregation in the United States and the brave students who desegregated the American education system. Reading that text in English and then translating it into Arabic made some students vow to work harder in their Arabic courses. Each Arabic-speaking country has words and linguistic habits that deviate from the formal language. Listening to some of their peers render the translations free of slang words and modernizations of the language made them keen to study their own language. Fatima Ibrahim, the Chapter President that spring, was one of the translators who inspired pride in her classmates. "It was challenging and fun," she said. Ibrahim is now earning a masters in translation at Durham University in England. "The Common Reader event has a lasting impact on our university," continued Nixon. "After holding three of these events we have witnessed how important our readings are to the community. A number of students and faculty from diverse disciples at AUK have asked me what do we have in store for spring 2013 and how they can participate. That question is in the hands our chapter officers. My first task this fall will be to read the text and think about how it may be difficult for our students to understand culturally." The texts chosen by Sigma Tau Delta challenge the university's conservative culture by their ideas, language, and location in American and world cultural dynamics. Sometimes we anticipate those difficulties, such as the one posed by Trethewey's focus on prostitutes, but at other times cultural objections catch us unaware. The latter happened as one professor was translating a section of Carey's Black Ice into Arabic. His translation was going well until suddenly he became red-faced, refused to continue speaking, and rushed from the room. He was too much of a gentleman to say something that translated into a vile insult in Arabic even though he was assured that it was the author's own words and perfectly acceptable to say a "black woman" in American culture. He used a different phrasing in Arabic that translated into "woman from Africa." Another tense moment occurred in the first event as the text revealed the graphic brutality of the life of a child soldier. At a particularly violent passage two female students were visibly disturbed at the words. "I paused the reader saying that I found the story heartbreaking and yet we needed to acknowledge the tragedy so that we can tackle this issue. The girls braved out the passage and later returned to hear more of the novella," said Nixon. "We have tackled genocide and culturally accepted and systematic racism. As I think back at over our first two readings, I can understand how the third time was a charm. The students were prepared to learn, listen, and share their own difficult stories." In spring 2012, we read Bellocq's Ophelia from cover to cover seven times, as participants alternated between the Common Reader and poetry in English, Arabic, Persian (Farsi), and French. As an acknowledgment of our university's cultural diversity, we encouraged participants to "challenge" the Common Reader with poetry in their mother tongues. Dr. Gholamreza Vatandoust, for example, read from the famous Persian poet Omar Khayyam. Dr. Gholam also paused between each selection to translate it into English and contextualize it in the poet's difficult career since he tackled issues not commonly discussed at the time. Students brought poetry in books, written on paper, or stored in electronic devices such as laptops and smart phones. William Blake and Elizabeth Barrett Browning appeared the most among the famous poet challengers. The common theme of the student compositions was either love or alienation. Each subject, in its own way, meshed perfectly with Trethewey's poetry. Mubarak Al-Mutairi participated in his second Common Reader event in 2012. Like before, Al-Mutairi stayed most of the day, leaving and returning as his schedule permitted. He brought his laptop, having several poems he wanted to share with the group. "It was fun. I was able to channel my inner orator," he said. The Official Newsletter of Sigma Tau Delta, International English Honor Society, Department of English, Northern Illinois University, DeKalb, IL 60115-2863. E-mail: sigmatd@niu.edu © 2012 Sigma Tau Delta. All rights reserved.